Never say i cant....... Life is full of barriers you can either be blocked or knock them down. Accept the challenge and grow stronger! No Fear on Wheels! Who is Shaun Gash? Let me start by telling you, he is not your ordinary person. Some call him an inspiration, others a role model. He would probably call himself a challenger. Every so often we hear about an individual that transcends their sport, and becomes something more. Shaun is one of those people. He has taken the OCR world by storm with what he has accomplished and without spoiling too much, we will let Shaun tell you his story himself. 24 years ago my life changed, some would say for the worst but for me on reflection for the better. I was involved in a road traffic accident where I was a back seat passenger. The car turned over and threw me out of the back window where I sustained some major injuries, breaking my shoulder; ribs puncturing my lungs and breaking my spine at T5/6 vertebrae leaving me completely paralysed from my chest down and at the time only given 2 days to live. I was 20 and thought my life was over. I spent 5 1/2 months in Southport Spinal Injuries hospital and a further 3 1/2 years in a rehab home for spinal injuries. But every cloud has a silver lining and I met my best friend, soul mate and wife Dawn at the rehab home. We have been married for 29 years, have 16 year old twins; Sharna and Kyle, and an 11 year old, Niamh. My world and addiction of OCR began when I went to support my wife as she undertook a course in the Lakes back in 2014. Whilst I sat there watching all the runners set off and finish, covered in mud and full of smiles I knew I needed to take part. But I never heard of a person in a wheelchair taking part, this was the ultimate challenge which would push the boundaries and be the most unbelievable accomplishment. I contacted the event organisers and for months had various correspondents flying back and forth with questions about what my needs are etc. and how this could be accommodated. Finally receiving a NO! I felt demoralised……. But not beaten. Simon Cranston, owner of VVV, suggested I contact the Chief of Born Survivor and explain what I wanted to do. As eager as ever I emailed the Chief and explained my situation, disability and ambition with wanting to complete his course. Expecting to receive a reply in a few days, I was shocked at the response I received the same night, if I could stand I would have fallen over! This was the start of the journey and NO FEAR ON WHEELS was born! My first OCR event was 4th April 2014 and changed my life. I have always been a positive guy and able to take on any challenge. But this was different it was the epitome of teamwork & family. I have gone from strength to strength, new wheelchair, new harness, new ambitions and new determination to conquer. Being in a position where trust, respect and support was the forefront of the event was amazing. Other runners throughout the day cheering the team on as we pushed, pulled and manoeuvred my wheelchair through mud, woods and places which wheelchairs shouldn’t go! OCR is not about being physically fit, its about being part of something which is indescribable until to take you part. You never think you can’t as you’re crawling through mud, over walls and being in water, it really brings the child out in you. You start off clean and finish covered in mud and looking the same as everyone else. PRICELESS! From the first event the #FAMILY has grown! The messages of support and inspiration from complete strangers has been humbling to me. I am just me and totally love the OCR community and events, having my wife alongside me who is my rock spurs me on and allows my family to ever increase. 2015 was a great year, completing Born Survivor twice, Gelt Gladiator, Ram Run, Mud 7 and being the first adaptive wheelchair athlete to compete and complete the first UK OCR Championships at Nuclear Races course. OCR has given me the drive and determination to push my boundaries further, completing more OCR’s; Sky dive and aiming for Kilimanjaro 15 August 2016 along the way raising money for different charities. This is over £25,000 so far. I have been asked by Tony Campbell of the OCR World Team Championship event to be their Disability Wheelchair Ambassador for their event in London 17 September 2016. Amazing gain the first of its kind in OCR. 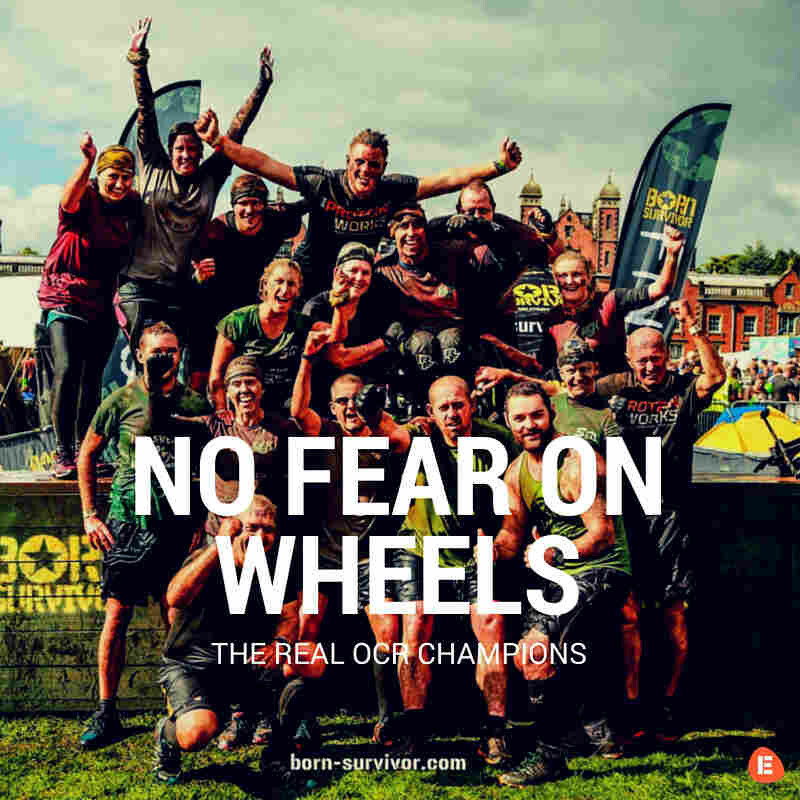 OCR is not about judgements, its about being part of a community who show how people support, encourage and help family, friends and strangers. This is what its all about. This year I aim to break down more barriers and be the first wheelchair OCR athlete to conquer even more courses and aim again to qualify for the UK OCR Championships in November 2016. Also the highlight will be the Guinness World Record attempt with Zeus Races “No Fear Challenge Cup” on the 18th June. We aim to have as many teams and wheelchairs on one course as possible, with the support from the RD’s Gavin Levitt and Mark Noble this is for the charities I’m supporting as well- Cancercare and Alex House Friends (disabled children’s charity) alongside the Kilimanjaro Orphanage. If you are inspired by Shaun’s story & would like to donate to Shaun’s Kilimanjaro challenge, you can do so here. You can also find out more about Shaun on his website here or even reach out to him on his Facebook or Twitter. Want to join the No Fear On Wheels community? Check out their Facebook page and show them some support! Visit EtchRock.com to get started and find your next challenge! The EtchRock blog is the home of all things challenge related. Find your inspiration or improve your knowledge with content from our fantastic community.